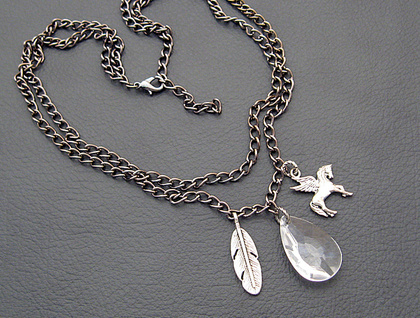 Three charms adorn this double-strand necklace: a silver feather, a clear, faceted teardrop, and a silver Pegasus. The necklace is formed of two strands of gunmetal black chain, layered so that they hang at different heights. The charms are attached to the lower strand of chain. 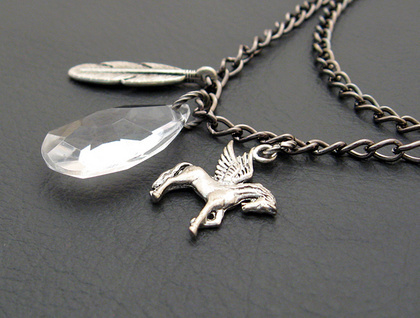 The Pegasus charm is made of lead-free pewter, coloured like antiqued silver. The transparent, crystal-like drop is lightweight plastic, but it shines almost like glass. The feather charm is made of antiqued-silver coloured metal. All three charms are attached to the chain with twisted, antiqued-silver coloured rings. 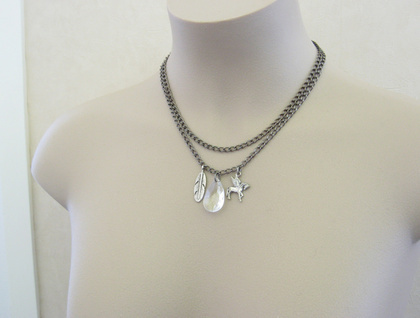 The necklace fastens with a lobster-claw clasp. Pegasus is a winged horse from Greek mythology. At first a wild creature, he was caught and ridden by a mortal hero named Bellerophon, with whom he had many adventures. At the last, Bellerophon tried to ride Pegasus all the way to the top of Mount Olympus, the home of the Greek gods. Outraged by such audacity from a mere mortal man, the gods sent a biting gadfly to annoy Pegasus. The insect irritated Pegasus so much that he bucked and threw Bellerophon, who was killed by the fall. Pegasus, however, continued to Mount Olympus, and, since he was a magical, immortal creature, was allowed to dwell with the gods forever. The name 'Pegasus' means either 'a spring (of water)', 'strong', or 'lightning'. This charms on this necklace represent one of Pegasus' feathers, which might have fallen to earth with Bellerophon, and the magical horse himself. The diamond-like drop represents both the creature's immortality (diamonds are a symbol of eternity) and the springs that were said to gush forth when Pegasus struck the earth with his hoof. This statement necklace measures 49.1cm, including the clasp. There is a little 'tail' of chain, measuring 5.6cm, to which the clasp can be clipped at any point, giving the necklace some adjustability. 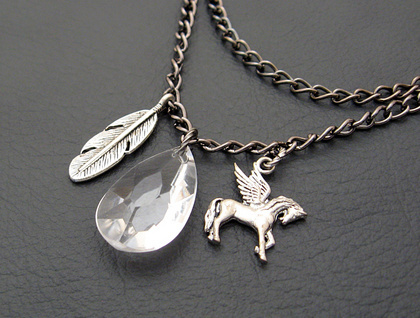 The teardrop measures 26mm from top to bottom, the feather is 29mm long including the baile (hanging loop), and the little Pegasus charm measures 23mm from top to bottom, including the baile. Matching earrings – the 'Horsefeather' earrings – are available here in my Felt shop.